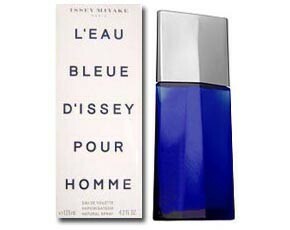 L'Eau Bleue D'Issey Pour Homme by Issey Miyake is inspired by the elements, yet as different as night and day. It is a symbol of water, life, energy and purity. Journey into a world of discovery. Top notes include lime, mandarin orange, lemongrass, rosemary and elemi, with heart notes of ginger absolute, star anise, nasturtium, may rose absolute and palmarosa. Base notes combine patchouli, sandalwood and musk mallow. It is recommended for a romantic occasion.